Almost every teacher has experienced the opportunity of having a special needs learner in their classroom. Special needs learners can range from those with exceptional abilities which can create excess boredom to those with some form of physical or mental disability that require extra help. These special individuals are capable of functioning in a regular classroom environment but may need some extra help in order to get the most out of their educational experience. Some of these students might need the implementation of methods that go beyond traditional classroom routines and can benefit from outside-the-box thinking. Some special needs learners work best with visual aids while others flourish with audio or tactile tools. Many will benefit from a mix of both. While there may be challenges associated with involving these students in your classroom, there are also great benefits. Educators are always searching for new ways to connect with their class and special needs students can help push teachers to find new learning resources. While typical workbooks and texts may be appropriate for the majority of your students, those with special needs will require additional methods. Incorporating the use of interactive tools such as whiteboards in these unique learning situations can not only help these students find enjoyment and learning in their day but can also help you connect with them on a level that may not be available through standard classroom practices. By utilizing the five Gynzy tools below with your interactive whiteboard, you can provide a smooth and engaging learning process for all of your special needs students. This interactive language arts tool provides a level of versatility that can work for every student in your classroom. Whether they require a higher caliber of spelling word or need to get back to basics, this program allows you to choose the words you want while you play. Reinforce the week’s spelling words by having your students play in pairs. Special needs students can benefit from both the educational and social aspects of the activity. This engaging hangman tool is the perfect attention-getter for the student who is struggling to focus. The continuous play and necessity of fast-thinking will keep your special needs students focused and eager to learn. This tool not only allows your students to learn how to correctly spell words, it also gives you a chance to teach new vocabulary as you introduce definitions and context within a fun game setting. To enhance play, give your students a clue by offering the meaning of the word before they begin to guess letters. This will help them make lasting connections between the words you use and their definitions. Other great language arts tools for your special needs students include the Create Your Own Memory game, Bingo with Images, and the Lyrics2Learn tool. The Math Safe provides your special needs students with the challenge of having to correctly solve math problems in order to open the safe. Problems are constructed when you choose the answer format you desire. Students solve the problems by dragging the right number to the correct area of the screen in order to open the locked safe. This interactive tool is the perfect way to engage your special needs students in the math-learning process. 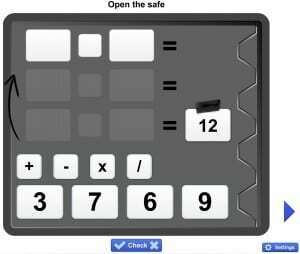 For those who struggle with numbers or are easily frustrated with problem solving, the Math Safe provides a fun and exciting way to work through the questions. The desire to “win” by unlocking the safe through finding the correct answers helps to motivate students to be persistent. Patience and deliberate thought are rewarded when students learn that correct answers bring them closer to unlocking the special safe. Your special needs students can also be engaged through using additional interactive whiteboard tools such as Paying with Money, Times Table ‘Flashcards,’ and Bingo. These games help take some of the frustration out of learning math as they incorporate concepts into a play format that all of your students will find fun. Engage your special needs students in science by providing them with one of the options from the Gynzy science tools. The interactive Human Body tool gives your students the chance to view the human body on multiple levels including the skeleton, muscles, cardiovascular system, organs, or nervous system. The Human Body program also provides students with the power to zoom in for a more detailed view, fill in the names of the different body parts, or see all the body part names displayed at the same time. The realistic diagrams help your students visualize the specific components of the body while providing them with an understanding of how these parts work together. Visual learners will love this interactive tool as it gives them the chance to see the various systems in the body up-close and in detail. This increases their ability to retain and recall the information they have learned. Additional beneficial whiteboard tools for science include the Solar System tool where students can watch the unique orbits of each of our solar system’s planets, the Magnetism app which allows students to determine which materials are magnetic and which are not, and the Structure of Volcanoes tool that allows students to explore one of nature’s most impressive forces. Help your students become involved in Social Studies by allowing them to use the interactive United States map. This map teaches students the names of all 50 states along with their capitals and the water systems that run throughout the nation. 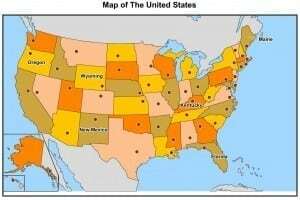 This tool will allow your class to gain an understanding of each region of the United States as they learn the states from the West Coast to the Eastern Sea Board. Test your students’ retention by choosing the ‘hide names’ option and quizzing them on the field of your choice. Add a competitive element by seeing how many names your student can recall in 30 seconds then have them work to beat their score with each additional round. Provide special rewards for your students when they can name the states and their capitals together. The challenge of recalling each state or capital can help motivate your students as they strive to better their previous score. Encourage students to explore social studies further by providing them with the interactive Flag Matching tool for either states or countries, the World Map, or the Globe to help them learn latitude and longitude. Surprise your students with the addition of a You Tube video in your lessons. Whether it’s a short clip reinforcing a science concept or a song to help with spelling word memorization, a video can be the perfect way to engage your special needs student. With the wealth of educational information available on the internet, a source such as You Tube can make a great companion for your interactive whiteboard. Adding a clip to your lesson is simple and with Gynzy, you’re able to use your link without having to work through search engines to find the right video again. Incorporate these additional learning tools and help grab the attention of special needs students that might otherwise struggle to focus on the material being presented. Keep your class engaged with other creative tools like the Gynzy Game Show which allows you to create specialized educational games for your students and the Find the Differences tool where your students can compare two images to pinpoint the differences in each. Regardless of the grade level or subject matter, the amount of information that can be obtained and utilized through interactive tools provides every student in your classroom with the resources they need to excel in learning. These resources also provide an engaging educational platform for special needs students so that they too can get the most out of their classroom experience. Every child deserves the opportunity to learn at the level and pace that fits them best and with the addition of interactive smart boards and their tools, you can help each student in your class reach their full potential. What is the perfect learning environment? To create the perfect learning environment for your special needs students, get to know them individually. Find out from parents or guardians which teaching methods have been successful at home. Discover their likes and dislikes then begin crafting a specialized plan based off the information you have learned. Work on incorporating interactive whiteboard tools that fit with their unique learning needs then watch for feedback as you begin using them in your daily plans. By working regularly with parents and guardians, you can encourage the use of some of these interactive tools at home so that concepts can be reinforced outside of the classroom as well. As the learning process becomes fun, your special needs students will become more engaged in their classroom setting and will look forward to the new opportunities in education which you and your interactive tools can provide.